Kilmarnock is associated with two major foundations of Scottish heritage and culture-whiskey and Robert Burns. It was where the famous brand Johnnie Walker Whiskey was invented, by a local grocer John Walker in the 1850s, and Kilmarnock continued to produce its most famous export until its bottling plant closed in 2012. The town is very proud of its whiskey heritage and the Johnnie Walker Bond building still stands in the town centre. Kilmarnock is also very proud of its literary legacy- it was the place where the first collection of poetical works by Robert Burns was published and today, the town has the biggest Burns monument in the world. The original statue and museum were constructed at the end of the 1870s and a modern visitors centre was constructed in 2004 after the site was partially destroyed by fire. As well as being able to find out more about the life and works of Robert Burns here, it has also become a popular location for company conferences and wedding receptions. Here at Hog Roast Kilmarnock, we feel that our way of cooking is perfect for a town that has such strong links with its country’s history and culture. The tradition of hog roasting itself, is deeply embedded within our culinary identity and whilst we still employ the same methods, we have modernised and refined the art of hog roasting, to make it an ideal dining option for events of any level of formality. Traditionalists can enjoy one of our classic hog roasts washed down with a dram of whiskey, whereas people who have different tastes or dietary needs can sample one of our alternative menus that may not feature a hog roast at all. 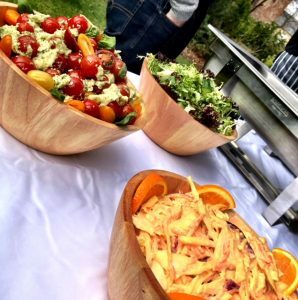 Because our menus are so varied, we are an incredibly popular choice for all different types of events in Kilmarnock, from festivals celebrating the town’s history, to wedding receptions and corporate events at the Robert Burns Centre. Wherever you choose to host your event in Kilmarnock, the Hog Roast Kilmarnock team will be able to provide the ideal catering option for you, with a menu that will please everyone and a style of service that compliments the theme of your special occasion.